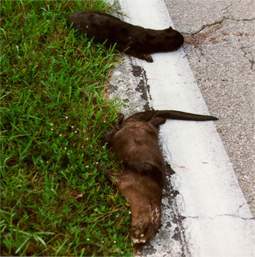 This pair of Otters were killed right at the roads edge. There was a drainage ditch and large drainage pipes just off the road resulting in a navigable waterway for these guys. We don't know if they're brother and sister, a breeding pair or not. 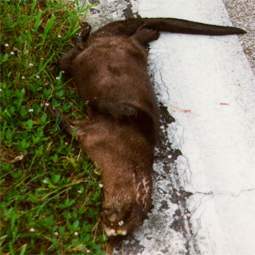 What we do know is it's a terrible loss for all of Pine Island as the number of otters seen on Pine Island are few as it is and these playful mammals brighten up everyones day.